Dog’s noses are between ten thousand and a million times more sensitive than our own. Putting this into something we can perceive, imagine a sandy beach, 500 metres long, 50 metres wide and nearly a metre deep. On this beach a dog can find two grains of sand that are different! Dogs can be trained to detect anything provided it has a scent – criminals, drugs, explosives, money, health conditions, dry rot etc. The Italian breed Lagotto Romagnolo is the only breed defined as a truffle hunter. This resembles a cross between a poodle and a terrier. Poodles are also associated with truffle hunting. Italians insist on using only Lagottos for truffle hunting, but the French view (and my own) is that almost any dog can be trained as a truffle dog if they are motivated by food or toys. Similarly, I believe that the age of the dog is not important. Some claim it is necessary to put truffle oil on its mother’s teats while a puppy, but many dogs we have successfully trained have been adults. While most dogs get enough exercise, few get plenty of stimulation. 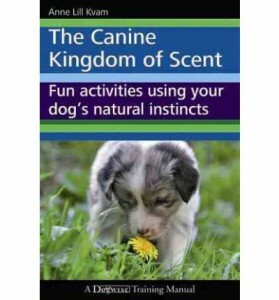 Most dogs thoroughly enjoy scent games. 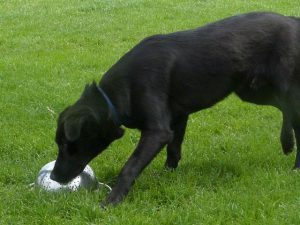 Truffle dog training can help improve the relationship with the owner – you have to work as a team! We have successfully trained four of our own dogs to find truffles. One went on to win the UK truffle hunting championships. Join us on a truffle dog training workshop at one of a number of locations around the country. Learn more. Our favourite dog training books to help with your truffle dog training. Learn more.